The most popular Canadian Provincial Nomination Program (SINP) is now open and accepting new applications under Express Entry and OID categories. 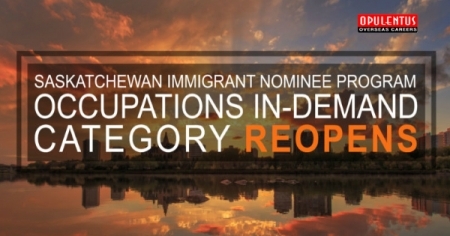 It is a known fact that Saskatchewan is the front-runner by providing high number Provincial Nominations to the aspirants looking to migrate to Canada. However this time SINP have bought few changes to its existing program, which came into effect from 27th December 2017. The key changes came in the form of removal of few occupations from the Occupations in Demand list, and the inclusion of ECA for the new applicants. The new applications for SINP have to accompany with Educational Credential Assessment (ECA) report from a designated authority, which verifies the qualification of the applicants, who completed their qualification outside Canada. The major jolt has come in the form of removal of NOC 2231 (Civil Engineer Technologists and Technicians) and NOC 2253 (Draft Technologists and Technicians) occupations from the Occupations in Demand list. Any applicant submitting their application post 27th December 2017 has to abide by the new changes. Saskatchewan is also reviewing to change the financial requirement (settlement fund) for their applicants as per the requirement of Immigration Refugee and Citizenship Canada; this may be revised on 5th March 2018.